Days of Passion Play Performance. Click here for year-round schedule. ( The Bible Museum (9:00am - 8:00pm), Sacred Arts Museum (11:00am - 8:00pm), and History Museum (10:00am - 7:00pm) are available for you to visit all day long. Free to see with donations gratefully accepted. 12:00pm-9:00pm – The Snack Shop is open with a great variety of food items and beverages. 12:00pm - The Living Holy Land Tour is where the Bible comes to life. Tours start every 45 minutes at 12:00pm, 12:45pm, 1:30pm, 2:15pm, 3:00pm, and the last tour at 3:45pm. In order to have the full experience, it is advised to start your tour by at least 3:00pm. Go to Noah's Ark Park Petting Zoo to see a llama, sheep, goats, a pygmy goat, a dog, miniature horses, a cross back donkey, rabbits, turkeys, and chickens! 1:00pm - Art Lessons with Shelli Manuel. $25 for 1-hour class. RSVP REQUIRED. Click here to learn more. 3:30pm – Backstage Tour - Meet at the flag pole. Tickets are available for $8 at the box office. 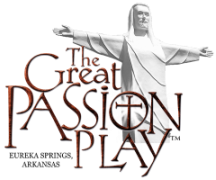 8:30pm-10:15pm (7:30pm-9:15pm after Labor Day)- THE GREAT PASSION PLAY! Gates open at 7:50pm (6:50pm after labor Day). Enjoy the pre-show. Stop at the snack shop at the entrance of the amphitheater and get some goodies to enjoy during the play. The Main Gift Shop is open after the Play. Jack Dawson visits the Passion Play about once a month. We will let you know when he is coming next as soon as we find out from the artist himself! Don't miss this great opportunity to meet the artist behind many of the modern masterpieces in the Arts Museum!